Tycor reportedly has much less core foam volume and taking up far less resin during infusion compared with conventional core materials. Metyx says that it plans to exhibit its newly acquired Tycor fiber reinforced core sheet material at the JEC World show. The sheet technology was purchased from Milliken & Company in the second half of 2018, and is now produced by Metyx USA, the company said. Tycor is a dry fiber and foam core, drapable, sandwich perform which is suitable for the vacuum infusion process. Metyx says that the fiber reinforced cores provide an alternative reinforcement material to balsa and conventional PVC foam cores, and the core material is flexible, non-structural, fine closed cell PU foam, designed to minimize resin absorption, with improved temperature stability and compressive and shear strength. Overall part weight savings in excess of 30% can be achieved. 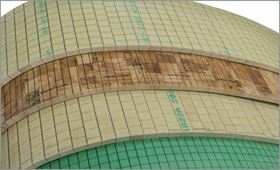 The standard sheet range available has five grades, offered in a choice of thickness from 12 mm to 75 mm (15/32 inch to 2 61/64 inch), with four drapable contour grades and a rigid sheet option. It is suitable for the wind, marine, automotive and industrial industries. During the show Metyx Group will also be promoting its complete range of resin transfer molding (RTM), multiaxial and woven glass and carbon fabrics and its kitting service for technical fabrics, preforms, cores and vacuum consumables, as well as plug and mold tooling, engineering and laboratory testing services. This story uses material from Metyx, with editorial changes made by Materials Today. The views expressed in this article do not necessarily represent those of Elsevier. Covestro says that its continuous fiber-reinforced thermoplastic composites (CFRTP) are now branded Maezio. EconCore says that it will be showcasing a range of its honeycomb core products at plastics show NPE2018.